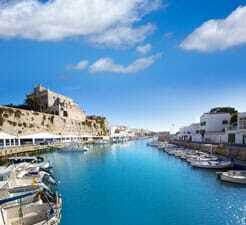 At directferries.co.uk you can plan, compare and book your ferry to Menorca sailing to the port of Ciutadella quickly, easily and securely online. With our ferry comparison tool you can compare all ferries to Ciutadella as well as all available alternatives in one quick and easy search. It really is simple to save on your ferry to Ciutadella with directferries.co.uk. All you have to do is select your place of departure, ferry route, number of people travelling on the ferry to Ciutadella and hit the search button. "Trip from Barcelona to Menorca"
We very much enjoyed the trip both ways, from barcelona to Ciutadella and return, The staff where very attentive and helpfull for my wife needs and assistance, very much appreciated. Also very puntual. "Good crossing...big improvements in Balearia facilities and staff attitudes"
Very good crossing, smooth and uneventful. Everything went smoothly checking in and staff were very polite and extremely helpful, which is a big improvement from previous trips. We stopped using Balearia for some time because they just made things difficult, but what a transformation now. They couldn't do enough to help and were very accommodating at all times. Glad they have pulled their socks up, they must have lost a lot of business to Acciona. We always travel with our dog and in the past they did not give any thought to the transport of animals, and this was very stressful to both the animal and the owners. Glad to say this has changed and pets are kept in a secure area under lock and key. Would definitely use Balearia again now they have improved. Well done Balearia!!! Comfy seats, plenty of space and decent facilities should have made this trip a pleasure. Unfortunately due to some nefarious neighbouring nocturnal snoring activities we arrived in Ciutadella rather exhausted. If Godzilla had not been asleep next to us I think the tori would have got 5 stars. Good way of convincing passengers to hire a private cabin!